The “documentary” in question, Mermaids: The Body Found, was actually pretty well done, even though a lot of the science was off and the reveal of the mermaid footage on a beach taken by a young kid looked extremely fake to me when it started moving. What jefbot mentions about the government having to deny the existence of mermaids – as ludicrous as that sounds – is real, though. I think a lot of that has to do with the show being on the Animal Planet channel, which broadcasts many genuine nature documentaries, so viewers are more susceptible to believe what they’re watching. Anyway, the most positive thing to come out of this whole thing is that it brings more awareness to massive Navy sonar testing going on, which is devastating to marine life. But, mermaids? Really? So did any of you BOTpeeps see this show? Did you believe it at the time? Reminds me of some of the taxidermist creations in a Ripley’s Believe it or Not museum. People have sewn fur on trout, monkeys on decapitated fish and wings on monkeys to convince people of “hybrids” throughout the ages. yeah, i’ve seen a lot of those, too, Rainey. and there’s a bunch of fake chupacabras and bigfoots and whatnot on the internet, too. Wait…this was a thing? That actually happened? Also, why does this Navy sonar thing sound EXACTLY like the Aquaman episode of Smallville? On a different note unrelated to mermaids but totally related to the comic, I love that ‘bot doesn’t even seem like he’s looking in Cornfather’s general direction on panel 3. It’s like the instinct to slap is so ingrained in his psyche that he doesn’t even need to look. yep, the whole “mermaid” hoax actually happened, Joe. crazy, i know. i didn’t really watch Smallville all that much (except the few episodes i saw at Michael Rosenbaum’s evil lair, of all places) but i’m thinking of getting in on the ground floor of the new Green Arrow show. I didn’t know there was a green arrow show. What channel and does it look good? i hope it’s good! Warner Bros seems to be pretty confident about it – there was a ton of Arrow promo stuff all over the San Diego Comic-Con this year. I didn’t see the show, but it sounds very similar to a “documentary” on dragons that Animal Planet a few years back. ooh, i saw some of that Dragons documentary, 52pickup! i thought it was pretty cool at the time. i wonder if anyone was fooled by that? If you’d seen the old posting of it by episode on Youtube you’d have seen a number of people that were believers, even though Sir Patrick Stewart’s voice explained at the beginning of every episode that it was fake and just a “what if?”. you probably would, MrSnow, cuz some of the visual effects are laughably bad. lots of bad photoshopping of old photographs, too. See, kids these days still have a sense of poetic imagination. i’m happy to hear that, Mentlegen. 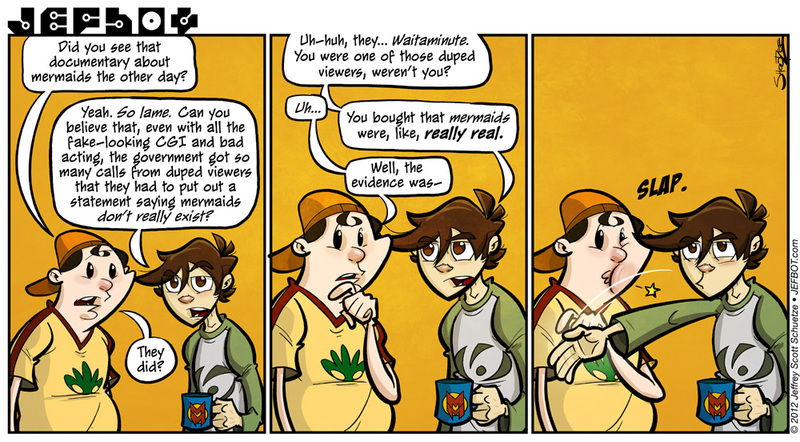 if there’s a reason so many people got duped by the mermaid show, i hope it’s for that reason. YES! Cornfather being set straight by Bot! I know this day will one day come! So now the score is what? What’s next? Mermaid Autopsy hosted by Jonathan Frakes? Where’s the Mermen, that’s what I want to know! Personally I’d like Mermaids to be real, I mean, wouldn’t it be great to have hundreds of Darrel Hanna’s roaming our ocean? Of course there would be protests that mermaids are corrupting our children with the toplessness and all that. not sure when it debuted, but they play it all the time and really don’t make any effort to let people know that it’s fiction. i suppose if they’re making that decision as a publicity stunt, it’s working. Best thing about the show was it identified another group of people who can be culled from this planet that no one will ever miss. (i.e. anyone who believed a single second of the show). Back when the movie “Hook” came out some people did another gullibility test. They told people that Dustin Hoffman actually cut off his hand to better fit the part of Captain Hook. They claimed that some people believed this. I was tempted to do a similar gullibility test when “Juno” came out by telling people that Ellen Page actually got knocked up just to do the role of Juno. I wasn’t sure how to set up the conversation to tell people this so I didn’t try it. Stating trivial knowledge out of the blue can get you looked at like you’re weird. now, with the internet, rumors come and go so fast, Rainey, especially in hollywood. remember that “Bruce Willis is suing Apple over the rights to his iTunes music” rumor? that was here and gone in a blink. i wonder how many people still believe the mermaid body was real, Better Thanyou? even after the govt put out that statement and the network has said it was fiction? those people and the flat earth society might want to have a meet and greet. I base things on what I see hear and can figure out logically, the government, is not the best source to tell you what is real or fake, to prone to cover ups. I don’t suppose you remember that dragons documentary jeff? the one where they supposedly found a dragon frozen in ice, and then made this huge documentary thing about them, basically making it look like they really existed, and then at the end some guy said “what if dragons were real?” i was crushed. agreed: it’s totally absurd, Insectoid! and i’m still not completely convinced that the statement wasn’t part of a publicity campaign for the show. I still haven’t seen the “documentary”, but I’ve been afraid to, for the reasons you’ve stated. For the same reasons I can’t watch any of AP’s “monster” shows. Because I want SO BADLY for them to be real, that I know I’ll be disappointed when I see the bad acting and bad effects. And the fact that I KNOW they aren’t real (at least not in this day and age; we ain’t got no magic) doesn’t help much. LOVE the strip though. As someone said before, the need to slap is so ingrained that you don’t even have to look… So, did the Cornfather REALLY watch the documentary? On a very much unrelated note, do you watch The Voice? Or have you been watching Go On or The New Normal? i haven’t watched any of those shows – been so busy lately, my dvr is still filled with old stuff from last season i haven’t watched yet! are Go On and TNN any good? that’s the sad thing, ky – some of the fx and acting are pretty darn good. and then the other stuff is just god awful. the actual skeleton they made is cool – if they had just made a fictional tv movie out of it, it could’ve been something worth watching. as it is – where it’s just kind of a lame hoax – it’s pretty bad. would love to find a half-human, half-fish, too. or a half-human, half-anything, really! i hope you have some other outlet then, Soul Man; since i don’t go around slapping my friends (much) i think i must be living vicariously through jefbot! I want to believe fantastical things are real. There’s too many stories about elves and dragons and the like to think there isn’t something behind them. Sigh…I know they can’t be real, but my imaginative actor-child brain won’t let me stop believing. don’t stop believing, Tiana! i think my “imaginative actor-child brain” is what keeps me young! and those fantastical things are much better serviced in your brain, rather than on lame faux-documentaries. Now I have to see if I can find that cheesy “documentary” just so I can see how bad it really is. Did I mention I love cheesy B movies? Especially horror movies. They complete me. Did…..Did Bot just B***H slap the CF?! Our circle of friends has “bad movie night” with the winner being the one who brings the worst movie, although it doesn’t necessarily have to be a horror movie. The winner by far is still “Star Odyssey” an Italian science fiction movie from the ’70s. Oh no no no, Best Cheesy B Horror movie of ALL TIME is…Jack Frost. No not the one with Michael Keaton. This one is about a serial killer who is on his way to the electric chair and there is an accident with some chemicals….Yeah…Killer Snowman BEACHES! i’ve seen the cover for that DVD a million times at Fry’s, Pixie! always wanted to give it a try but never did. wasn’t there a sequel to it, too? maybe this halloween i’ll have to check it out …right after i watch Trick R Treat again! YES! The sequel was even worse! It was on a tropical island…with no snow! But he like mixed with the sand or something. OMG YES! So you finally popped the cherry on that Trick R Treat blu ray huh?! What did you think?! I’m dying to know. Ever see Uncle Sam? About a serial killer dressed as, well Uncle Sam? If you liked Jack Frost (which I did, loved it actually) then you’ll like Uncle Sam. But, really, the worst movie ever made is Birdemic: Shock and Terror. There are no words to describe it, none, I don’t think a word has been invented yet and if they did it just wouldn’t be enough. i think i saw that movie when i was a kid, Oz! will have to cue that up on Netflix if it’s there. morning, Pix! now those Weeki Wachee Springs mermaids are mythical beings i can believe in! and, yeah – i love cheesy B movies, too. if this “documentary” had been one of those, it would’ve been so much better! My friend Jessica is one of the newest Mermaids. She loves every minute of it. And she kj’s karaoke at night. And P.S. can i say that the slap was kinda hot? Or would that be weird? I’m still waiting for my documentary “Centaurs, Hooves of Destiny” to get its air date. That made me giggle. My roommate liked it too. Like when War of the Worlds was a radio broadcast and everyone freaked out. now that is something that was actually cool, dj! at least it was plausible, had a story, and the station actually let people know it was fiction. how awesome (and frightening) would it have been to actually believe martians invaded earth!!? glad you and your roommate dug the strip! Well the government had to people that zombies weren’t real after the Florida incident.. So do I believe that people would think mermaids were real after that program? Of course I do! It’s what makes the world the wonderful place it is, where else can we have such entertainment for free from others? I am sitting around at a bar waiting for my how to start, and before hand their is karaoke(for about an hour, till a crowd comes) and this big biker guy just sang a lady gaga song. This is why I love life.. I just want to call attention to that sweet Miracle Man mug. Also, I saw that “documentary” with my sis and she was totally into it. The “found footage” didn’t fool me, as did the ending, but the actors were selling it pretty good. Sometimes it’s fun to believe in the unknown. WOO! always happy when a reader notices those little details, Jimmy – especially when that reader’s a Miracleman fan! SOOOOOO good to be back. I finally got a new laptop that will not take 5 minutes to open your strip everytime, Jeff! Been laughing out loud all morning catching up! Menapace! thanks for the LOLs. good to have you back and happy to hear you have a new laptop. still writing, i hope? Yes sir! And I’m still hoping one day that you’ll agree to illustrate my children’s book! It’s right up your alley–very Calvin and Hobbes-esque. I’d like to see that. It’s called The Boy and the Beastie Bully. It’s about a boy with a monster under his bed that bullies him every night, and the boy finally stands up to the bully, thus taking away its power and making it vanish. Jeff’s art would be PERFECT for it! sounds cool, Jeff! unfortunately, i’m still completely swamped – as you can see, i can barely get the strip up on time – but i’m intrigued. we should talk. Anyone remember the dragon special? It was like this one, but with DRAGONS. i think it was on Animal Planet, too, Whistle-Tall! i didn’t have as much of a problem with that one – i remember liking it, actually – probably because it didn’t seem to be trying to fool its audience as much as the mermaid doc was. I saw part of that while at work. TOTALLY AWESOME! I <3 dragons! I hope they make more series like this. Even though it's all speculation, it's great stuff for us fantasy geeks. Ooh, maybe the can do one on the Tarasque (French folklore, not D&D). …and I just realized that someone already commented with that. I wanted to see that Mermaids show, but oh well. No big loss. Personally, I love watching Travel Channel in October. They show all those ghost stories and haunted locations. So cool! There’s the Myrtle’s Plantation, Loretta Lynn’s Haunted Plantation and more! Even if it’s not real, it’s still FUN! ha! i didn’t know Loretta Lynn had a haunted plantation! love her music. i’ll have to try and catch that show if it comes on again. I was fascinated with the “Bloop” the first time I heard about it. What threw me off about that documentary is that they were trying to link that to the existence of merfolk… (or, at least, they cite it as one of their “clues”) However on the NOAA website they said that the sound was heard across something like a 5,000 km area… meaning that whatever made the sound would have to be SIGNIFICANTLY larger and louder than any recorded creature on Earth. Even for a mockumentary it’s a sketchy connection. TOTALLY, Alexander – the Bloop was the most interesting part of the show. (but made no sense how they tried to tie it in.) i have a germ of an idea for a future strip featuring it. we’ll see if i can make it happen. Meh, I really wish they had not shown that on animal planet, as you said a lot of people consider that place based entirely on fact, and when a vast number of people don’t happen to look up a bunch on random sciences (like many nerds like myself do), it becomes really easy to miss the bull numbers and “facts”. Someone tried to get in a argument with me about how that “document” was legitimate until I had to google it on my phone and outlined “Editor’s Note: This two-hour special is [b]science fiction[/b] based on some real events and scientific theory.” Twas funny their reaction. SO glad you set your friend straight, Zolen. although, i think at this point, if a friend of mine believed the show was real, i’d totally keep that belief going. heheh. Never heard of it before this particular strip, according to my memory. Now I kinda want to see it out of morbid curiosity. i’m sure they’ll start showing it again around Halloween, NeoD. and while it’s not all bad, i’d record it and then zip through it so as not to waste any more time watching it than you absolutely have to. They did a ‘How to Tame Your Dragon’ show. really? i might have to track this down. i thought the Dragons thing was pretty cool, too, JeweledRose – mostly cuz it didn’t seem like they were trying to trick anyone. also because i like dragons more than mermaids. Oh how many times I’ve wanted to slap my friends for believing in something stupid…. Nice! I couldn’t have said it better myself!